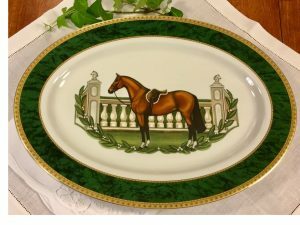 Just in time to be the centerpiece of your Derby-themed dinner this Saturday, I found the great Hampstead Porcelain Platter from Patricia Borum. Find the Hampstead Porcelain Platter from Patricia Borum here. See all the fine equestrian-themed works of art from Patricia Borum here. 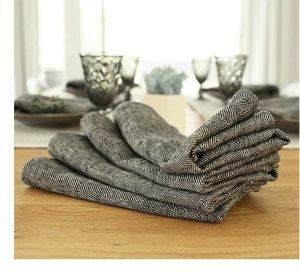 The fine folks at Linen Me have a great line of high-quality napkins from which to choose – but I fancy their Black Linen Chevron Napkins. Find the Black Linen Chevron Napkins from Linen Me here. See the full line of fine napkins from Linen Me here. Meanwhile, the fine folks at Juliska offer a fine line of tableware, including some pretty nice napkin rings like their stunning Tortoises Knot Napkin Rings. 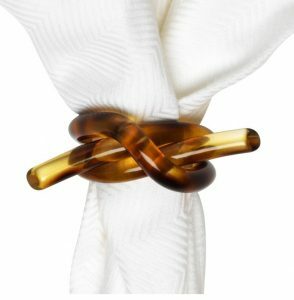 Find the Tortoise Knot Napkin Rings from Juliska here. 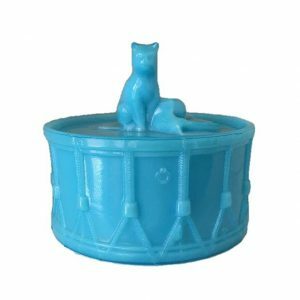 Find all the great items for you table from Juliska here. Not only have I recently moved my home, I also recently moved my office. We moved into a brand new modern building which is very cool and I have one of those desks which can be raised and lowered so you can sit or stand. I like to sit and stand so that it cool, but I also like to sit at a high desk so I am in the market for a stool so I can sit instead of stand when it is raised. I think I have found just what I want the Baxton Studio Architect’s Industrial Bar Stool I found from the fine folks s The Mine. Find the Baxton Studio Architect’s Industrial Bar Stool from The Mine here. See all the great home furnishing from The Mine here. 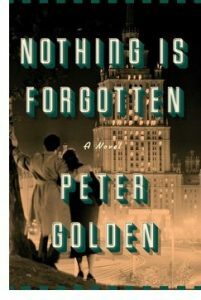 It has been long time since I read a good novel, so it was a great pleasure to have recently discovered Nothing Is Forgotten by Peter Golden, an engrossing story of a young man in search of his heritage, and answers, against a post-war setting – and I loved it. Nothing Is Forgotten by Peter Golden is available from Amazon and other fine booksellers everywhere. I love the art prints from the fine folks at Meri-Meri. Heck, I love everything about Meri-Meri, their products just make me happy. 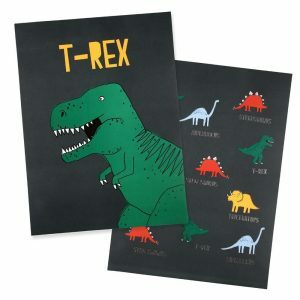 Take Meri-Meri’s Dinosaur art prints for example – just a lot of fun. Find the Art Prints from Meri-Meri here. See all the joy that Meri-Meri offers here. As a society, we celebrate the most successful people. But what if we were to look at those at the bottom of the scale? That is what the fine folks at the Fund for Peace have done with the Bottom 100 to call attention the millions across the world they represent. 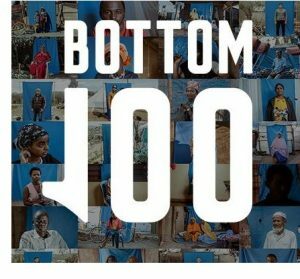 Learn more about The Bottom 100, the Fund for Peace and how you can help here. My mother’s kitchen was full of roosters. Well, roosters and other farm animals that complemented her country kitchen motif. 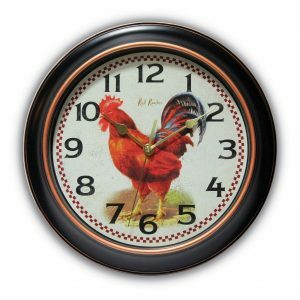 I am thinking about giving a nod to mom with the décor of my new kitchen – something like the Rotterdam Rooster Wall Clock I found from the fine folks at Home Bello. Find the Rotterdam Rooster Wall Clock from Home Bello here. See all the fine home accents from Home Bello here. But then there is the option of going with a teapot kitchen wall clock, like the one featuring Royal Albert’s Old County Roses pattern I found from the fine folks at Replacements, LTD. 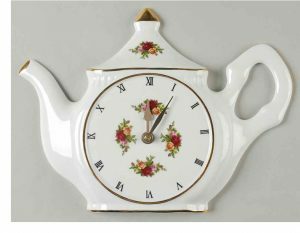 The Royal Albert’s Old County Roses Teapot Wall Clock can be found at Replacements, LTD here. I am realizing more every day that Lost Cowboy has become more about the things that I haven’t found rather than the things I have. 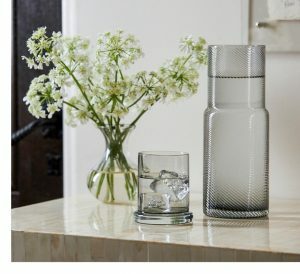 But that’s ok. Like, well, I am still searching for the perfect water carafe to keep by my bedside – like the I found from the fine folks at Irwin Ribera. Find the Banca Carafe from Irwin Ribera here. See all the fine home accents from Irwin Ribera here. Lost Cowboy is powered by	WordPress 5.0.4 and delivered to you in 0.879 seconds using 58 queries.